For all of you commenting on what a 'lovely soul' Henry has, I can confirm 100% – actually that's a perfect description. He's one of the nicest people I've met, regardless of any fame or fortune. 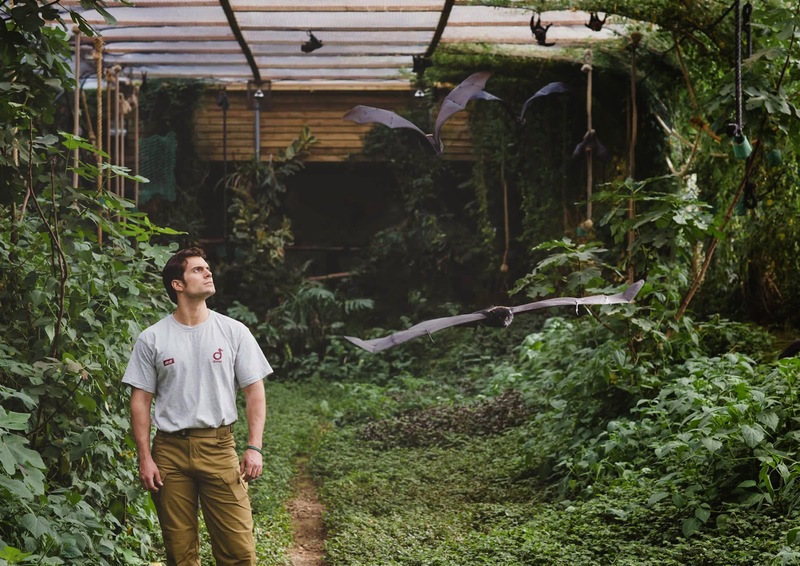 His visit to the 'Island Bat Roost' happened because the enclosure is built using 100% recycled materials, heated by a biomass burner (in which we burn soiled animal bedding, itself made from shredded paper from the offices) and purpose built to allow the rarest fruit bats in the world to fully exercise their flight muscles. The movie link is coincidental, but it's awesome none-the-less! Yes it is! - thanks Rick for your feedback on this burning question. You can learn more about Livingstone's fruit bats at Durrell's site. Don't forget you can also become part of Henry's new Gorilla family at the park, by visiting Cavill Conservation. Beautiful pic. Henry Has a good soul, hope he never loses that. Those bats are huge!!! Clever way to make a bat roost - too bad it costs a fortune to make such eco-conscious abodes for people. So glad he's using his popularity to bring light to this good cause.